I can’t speak for 1934, but nowadays it’s definitely on the way from somewhere, as I just proved by riding a bus across the border from Mexico. We’ll see if it’s on the way to anywhere if I’m allowed to leave the country later this month. It’s also not uninhabited, as any Belizean will tell you. Nevertheless, international awareness of this Central American country still isn’t high: excepting perhaps amongst deep-sea divers and cruise ship regulars. As a country, Belize is still a bit of a paradox: English-speaking in the heart of Latin America; no one dominant ethnic group; a member of both the Caribbean and Central American communities. Arriving into Belize City, you can feel the British influence, and not just thanks to the gaze of Queen Elizabeth (uncannily unaged, unlike UK currency) staring back at you from every Belizean dollar note. Tourism is the second-largest, and by far most conspicuous trade here (it would be number one were it not for the agricultural sector buoyed by the country’s busy Mennonite community). The feel is of a British seaside town slightly down-on-its-luck: a Dover or a Ramsgate, perhaps. With Huxley on my mind, I’m determined to take Belize seriously; though I allow myself some giggles on the first day, driving past the town of Yo Creek. 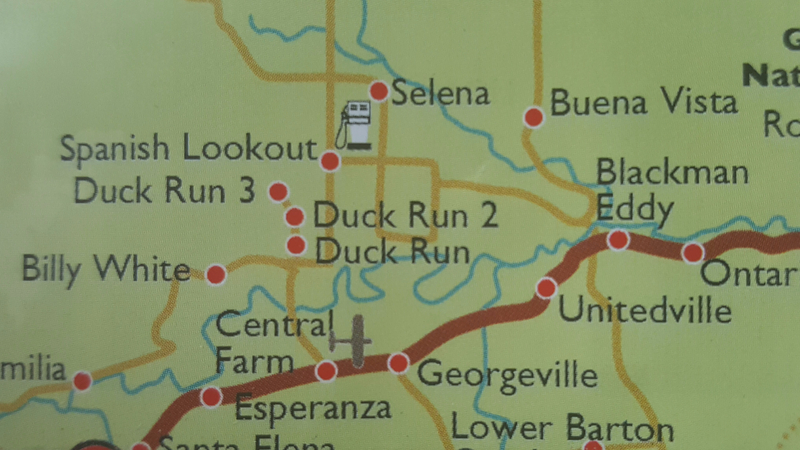 Later on I have to make more allowances, as we pass signs for three towns: Duck Run, Duck Run 2, and Duck Run 3. Then I visit an island off the coast named Wee Wee Caye and all bets are off. I wonder if perhaps it’s better to leave the po-faced travel to Huxley. The Belizeans I meet certainly don’t seem to be taking life too seriously. Duck Runs 1 through 3. Near such cheerful towns as Double-Headed Cabbage, Teakettle, and Blackman Eddy. Groggy from the bus, I ask around in Belize City on my first day for the nearest bookshop. After some excitement about my British accent, I receive mostly long, rambling stories, which do eventually culminate in some recommendations. These recommendations, on interrogation, all turn out to be for drinking establishments. Everyone seems determined to put me onto a boat to one of the tourist cayes or coastal resorts. That I would be hanging around downtown Belize City looking for books doesn’t make a whole lot of sense to anyone. I trade confused smiles. Further enquiries lead me to a small shop attached to an art studio by the docks. Peering through the window, it looks promising, but it’s closed. The sign says “open 9-4”. It’s 9.30am, and I’m told by the kreole men sitting on the pavement that “he’s late”. They seem pretty relaxed about it. I return at midday. “He’s at lunch”, I’m told. Finally, I return at half 3. “He’s closed”. I begin to suspect a conspiracy, albeit a very laidback one. The eventual solution is one of the “government bookshops” that dot the country: quasi-private school bookstores. I again find it closed during the advertised opening hours, but the security guard of the neighbouring school has a spare key, and takes my cash for a $7 paperback. I get another confused smile for free. Belizean literature is still fairly nascent, after only 25 years of independence. 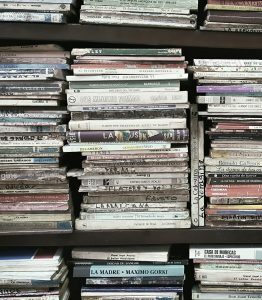 It’s clear from the handful of local names that fill the shelves that there’s national pride in their published writers, but there just aren’t that many of them yet. I pick Zoila Ellis’ collection of short stories: On Lizards, Heroes and Passion. The more obvious choice is Zoe Edgell’s Beka Lamb, probably the only Belizean book well-known beyond its borders; but as highly-regarded as Beka Lamb is, I feel like many different stories might be more apt for a country of such diverse faces. As a book to read in Belize, it couldn’t be more fitting. All the supporting cast are here: Christian communities and kreole lore, US immigration, the Mennonites, local dialects, lizards. You can see why they would study it in schools: its stories are perfect crystallisations of the national narratives that fill tourist literature, with just enough thematic conflict to fill student essays. Zoe Edgell herself is an ex-judge, and the book comes with a supportive foreword from Governor-General Dr Colville Young. The best story is undoubtedly the last one: ‘A Hero’s Welcome’, which (without ruining the ending) is a wonderful comic farce in the style of Stella Gibbons or even Donald Barthelme. Not all seven tales live up to that standard, and I can tell it’s not going to be one of the subtlest masterpieces that I’ll read on this journey. Some of the characterisation is fairly broad-brush, and in some cases it’s not clear if we’re supposed to be reading the stories as satire or not. Still, it keeps me company in the capital for a day or two, and I’m grateful. I spend the next few days exploring the coast, and then head inland, where jungle takes over from ports and where Mayan faces largely replace Kreole ones. In my guesthouse near the Guatemalan border, I search through a pile of dusty paperbacks I find, stacked under some flower-print tablecloths. This is my favourite part of travelling. One of them is a copy of the 1978 (pre-Twilight) pulp vampire work, The Holmes-Dracula File; missing the first 140 pages. The author, of course, is American. It says something about the ubiquity of US culture that this crumb of sci-fi ephemera could end up here, so far from home. I think about what Belizean writers might achieve in the next 25 years of independence. I put the book back and hope that one day someone will find a battered copy of Relative Harm: A Belizean Mennonite Mystery in its place. A story for another day. A local historian told me that 80% of the country’s food was grown by Mennonites, despite them making up only 3.5% of the population. I’ve been unable to confirm this, but I could believe it.